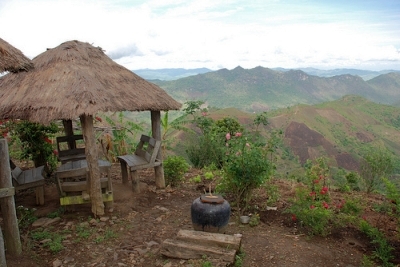 Follow Christina on her 62-kilometer trek through the hills of central Myanmar, the country formerly known as Burma. The bus from Yangon (also known as Rangoon) crawled away in a swirl of dust and exhaust, leaving Marjan and me standing alone and delirious from lack of sleep on a dark street at 3 a.m. The bus had delivered us to Kalaw, a popular trekking base in Myanmar, three hours early. After just two days, the country was already living up to its oft-repeated comparison with George Orwell’s “1984.” In Myanmar, up is down. Left could be left, or it could be right — the steering wheels of local vehicles, we had noticed, might be on side one or the other. And now the most outrageous evidence so far: a public bus that arrived three hours ahead of schedule. Marjan, my travel companion, held the flashlight as I squinted at the map in our guide book and led us the few blocks to the Golden Lilly Guest House. Beyond our most immediate need of a place to sleep, our plan was to hire Lilly’s brother Robin, a well-regarded local guide, for a three-day, 62-kilometer trek through the hills from Kalaw to the western shore of Inle Lake. Besides the physical challenge, lovely vistas and chance to interact with local villagers, the trek promised a respite from the tension and paranoia (real or imagined) that we were constantly being monitored by a government suspicious of independent travelers. More practically, the trek promised a transportation option that did not feature the organ-jarring discomforts of bus travel. Sitting on the western edge of the Shan plateau in central Myanmar, relatively cool at an elevation of 1,320 meters, Kalaw is ideally situated for one-, two- or three-day treks. 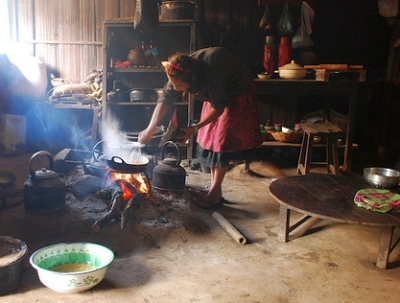 Many of the surrounding villages are peopled by so-called hill tribes: the 150 semi-nomadic, ethnically distinct clans who settled in northern Thailand, Laos and Myanmar from Nepal, Mongolia and China around the 19th century. Deliberately self-isolated, they form nominally self-sufficient communities that maintain their own language and customs. In Myanmar, they also bear the brunt of the malicious and arbitrary persecution typical of the government — jailed or executed without cause, used as slave labor for municipal building projects, and sometimes forced to move their entire village with just a few days’ notice. A few mornings later, Robin led us out of Kalaw, setting a brisk pace westward into the hills. We were scheduled to cover 18 of the 62 kilometers that day. Our daypacks carried only essentials: change of clothes, umbrella, rain poncho, camera and toothbrush. Lilly had arranged to deliver our larger backpacks to a guest house in Nyaung Shwe, the village on Inle Lake where we would arrive, theoretically, in three days. Robin’s height, ragged cotton trousers, not to mention his Sikh turban and beard, seemed out of place in a country peopled with slight, clean-shaven men wearing sarong-like longyis. His grandfather had been stationed in the area with the British army during World War II. Like many other Indian and Nepalese former soldiers, he decided to stay on after Burma achieved independence in 1948. Robin grew up in Kalaw. These hills, he told us, were once swathed in humid jungles teeming with tigers, elephants and wild pigs. When he was a child, his father wouldn’t let him out to play, for fear that the tigers would get him. Now he leads tourists across the same hills, by now denuded by foreign logging companies who paid off the Burmese military junta. This strip mining, coupled with the local practice of slash-and-burn land clearing, has transformed the hills into farmland that supports crops such as corn, soybeans and tea. About three hours after leaving Kalaw we arrived at the Viewpoint, an aptly named hilltop guest house and “resting place.” The proprietor, a Kalaw native of Nepalese descent, served us green tea and papaya as we sprawled out under the thatch-roofed gazebo. His daughter quickly went to work cooking us sweet potato curry for “lunch” (it was only 10:30 am). After lunch we continued at a remarkably fast pace, periodically stopping in villages to meet locals, sip tea in their homes, and — frankly — catch our breath. Like a page out of a fairy tale, the homes we visited were made either of bamboo, wood or brick, depending on the family’s wealth. Some even boasted glass windows. The floors were covered with bamboo mats that could be positioned around a low wooden table during meal times or spaced around the room at night for sleeping. The only adornments were a Buddhist shrine in the corner and, inexplicably, wall calendars, often a few years old and featuring what seemed to be heavily made-up Myanmar celebrity couples. With me sweating under my plastic poncho and Marjan carrying an umbrella in one hand and a roll of toilet paper in the other, we slogged through the mud and rain, crossing rice paddies and ravines, following cow paths through fields and scaling steep, rocky slopes. The second day was not about beautiful landscapes or getting educated about the flora and fauna, it was about surviving. Just past noon and just before a torrential downpour, we slid into Konla, a Danu tribe village, for lunch. 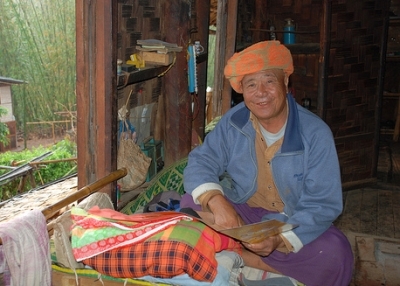 Our host was a jolly, wrinkled man wearing the traditional Danu orange headdress, orange flannel shirt and purple longyi. As we sipped tea and rested, he sat by an open window, gazing thoughtfully at the intensifying rain. After lunch we waited as long as we dared for the rain to abate and then set off again, leaving just enough time for us to straggle in to the monastery, dripping wet and sheathed in mud, just before nightfall. The simple teakwood structure, its ornate metal roof streaked with rust, sat on a small hill between a scrap of jungle and a series of Danu villages. We cleaned ourselves up as best we could before our audience with the solemn and friendly head monk. We wanted to make a donation, since the local villages depend upon the monastery to help pay for school supplies, health care and other necessities. We awoke before dawn to the chants of novice monks. The rain had abated overnight, easing our trek for the last 18 kilometers. As we crested our last hill, the sun broke through the clouds and sparkled against Inle Lake, a few kilometers below us. We smiled and slid our way into the convoy of villagers carrying produce and traditional textiles to the markets along the lake. A few hours later we arrived in Nyaung Shwe, filthy, drained and delighted that we had survived the first of many tests of our fortitude in Myanmar.